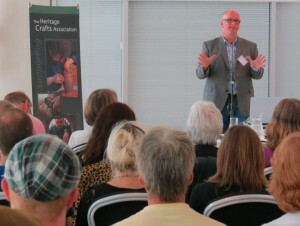 As an organisation with a remit to support traditional crafts nationally, but without a physical headquarters, it was felt that the choice of venue and location was an important part of the event. With its geographic location, history of craft trades and surrounding communities of craftspeople, Sheffield was an ideal choice. The Sheffield Millennium Gallery, home to the Ruskin Collection and a great collection illustrating the history of Sheffield metalware, welcomed HCA Trustees, speakers and workshop attendees on Saturday 8 September 2012. Presentations and practical sessions were led by Andy Evans, from PurePR, Clare Jenkins from Pennine Productions and Ellen O’Hara, Lucy Kyle and Emma Thatcher from Cockpit Arts. With kind support from the Radcliffe Trust, the Heritage Crafts Association were able to offer places at the workshop at a subsidised rate.